Doctor Octupus hasn't been confirmed for Spider-Man: Homecoming 2 yet, but there's one actor who might be perfect for the role. How do you feel about the idea of seeing Mark Hamill, the man who brought Luke Skywalker to life, play Doctor Octopus in the Marvel Cinematic Universe someday? It's a bit of fan casting that was recently put forth on social media and, as it turns Hamill actually seems to be into the idea as well. In fact, he literally liked the idea on Twitter, leading us to believe he would do the job, were Marvel interested in pursuing him. This whole thing started with a fan by the name of Anthony King, who goes by the username @AgentOfAwkward on Twitter. He recently threw out Mark Hamill's name for the role of the classic Spider-Man villain. His fan casting was accompanied by a couple of photos of Hamill and Doc Oc from the comics. The tweet attracted a bit of attention and Mark Hamill actually liked the tweet himself. 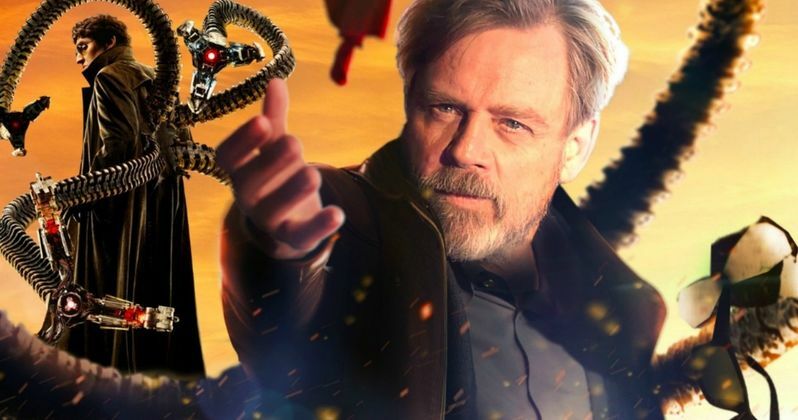 "The more I think about it, the more I like the idea of @HamillHimself playing Doc Ock in the MCU"
Firstly, before we get too carried away here, Mark Hamill is very active on social media and regularly engages with fans. So him liking a good-natured tweet about casting him as a famous comic book villain isn't all that strange. But with the Spider-Man movies back on track in the MCU, and with Doctor Octopus being one of his most famous adversaries, it's not hard to imagine that someday we'll see him back on the big screen. And Hamill does seem like an excellent choice. With that said, at the moment, this is mostly just a very fun idea to entertain. So, how realistic is this? For one, Mark Hamill has a bit of star power right now, at least a little more than usual, thanks to his return as Luke Skywalker in Star Wars: The Last Jedi. He's also an enormous comic book fan in his own right and, since Star Wars is a Disney property, he has a great relationship with the studio in charge of Marvel. The problem is that it looks like the new Spider-Man movies are going to feature villains we haven't seen in previous movies. Since Doc Oc was portrayed, rather excellently, by Alfred Molina in Spider-Man 2, that may kill this fun bit of fan casting. The Spider-Man: Homecoming sequel is set to start filming this summer and will be released on July 5, 2019. Tom Holland is likely to play the character in at least one more solo adventure beyond that. Could we see Doctor Octopus on screen again by that time, despite the desire by the studio to feature new villains? Fans would very likely be happy with that and, even possibly even more so, if Mark Hamill were cast to play the part. Anthony King put it out in the universe and, even though it's not much, Hamill seems to be into the idea. Your movie, Marvel.